It is my goal to assist my patients in their return to health as comfortably and quickly as possible. I encourage education and active participation of my patients in their achieving and maintaining optimum health. Lisa Devlin, DC, MS is an Activator Methods Chiropractic practitioner. 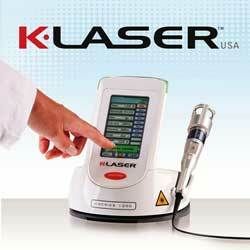 She has been in private practice in Mountain View, CA since 1993. Three times voted the “Best Chiropractor in Mountain View” in 2005, 2006, and 2007, Dr. Devlin's mission is to assist her patients in their return to health as comfortably and quickly as possible. She encourages education and active participation of her patients in their achieving and maintaining optimum health. She explains to each patient what their condition is and the treatment procedure. If you have a question, she is always accessible via phone or email. Welcome to Dr. Lisa Devlin's Office! I have been in private practice in Mountain View since 1993. 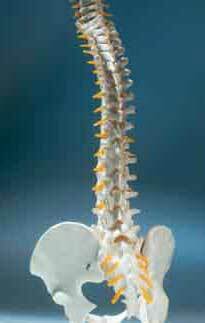 I practice the Activator Method Chiropractic Technique - a low force and effective method of care. I work with patients to get them back to the activities they enjoy as quickly and comfortably as possible. I especially enjoy working with athletes training for an event, people who have been in auto (or other) accidents and people with headaches. I have written a booklet "Survival Guide to Traveling with Lower Back Pain". I am also the only chiropractor in Mountain View to offer Class IV Laser Therapy, a drug free, surgery free, non-invasive method of pain relief. Patients choose this office because they want a natural approach to better health. On your first visit you'll meet with Dr. Devlin to discuss your current health situation and to see if you're a good candidate for chiropractic care. If we think we can help, we'll conduct a thorough examination. This helps to identify the likely cause(s) of your problem. We'll tell you what we found, what we can do to help and give you an idea of what to expect and an estimate of how long it may take. I practice animal chiropractic, which is only available in conjunction with your veterinarian. I am licensed by the Nevada Veterinary Board as an Animal Chiropractor. California has no such licensure at this time. The laws regarding animal chiropractic are very different for California and Nevada so please contact me for details on starting care for your small and large animals. I work primarily in the South Bay area in Northern California and in the Reno area in Nevada. I am willing to travel outside of these areas by arrangement. On-site chiropractic and laser therapy is available either in conjunction with an animal chiropractic appointment or just for humans at their location. If your company would like to offer this service to your employees, please contact me to discuss details. Dr. Lisa Devlin, D.C., M.S. On rare occasions, my office hours may change. Please check the Calendar or call the office for up to date information. 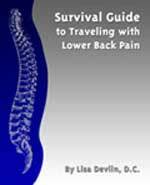 Please check out Dr. Lisa's booklet: Survival Guide to Traveling with Lower Back Pain. Click above for more booklet info.